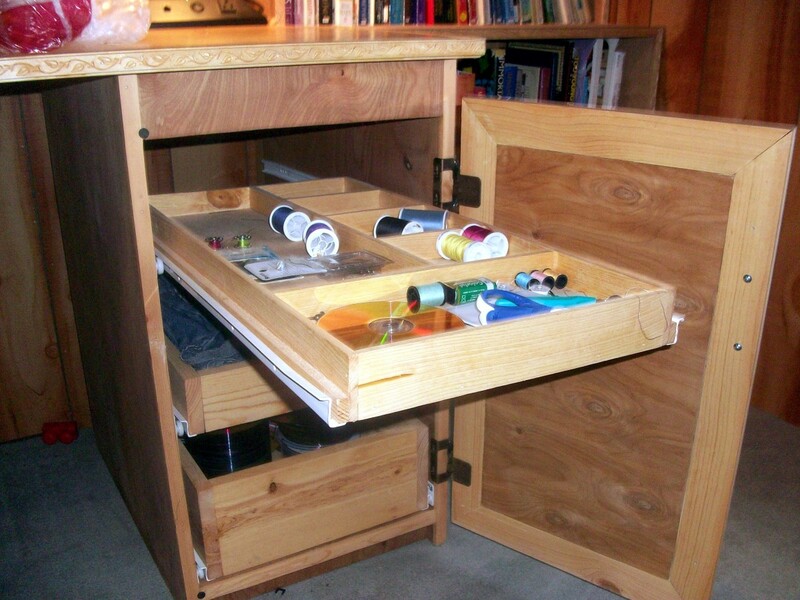 Why not design and build your own sewing table, complete with sewing cabinets? It can be made to fit your room, your needs, and your sewing style. 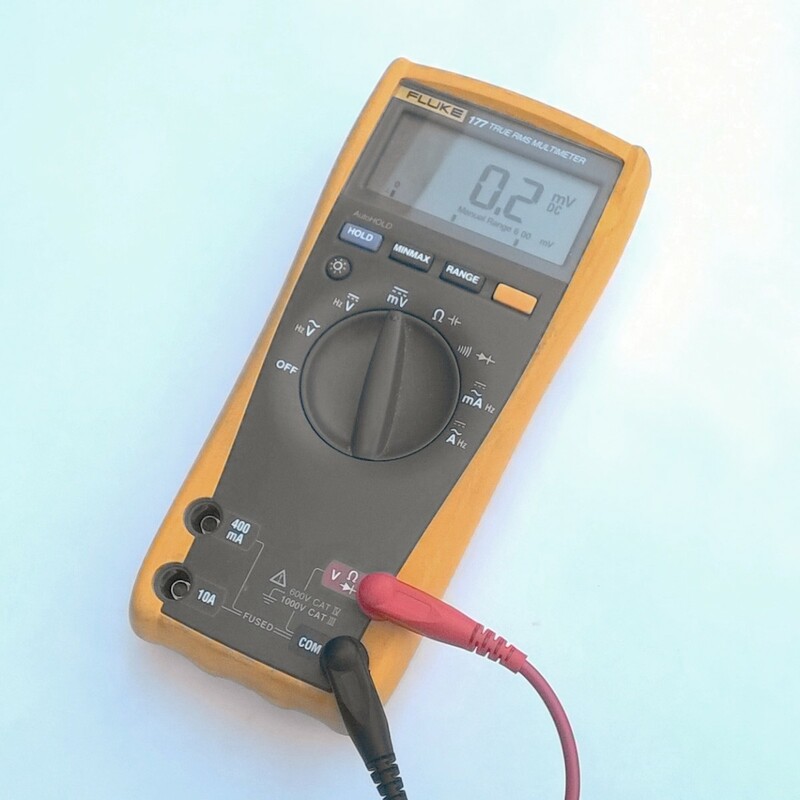 While perhaps not a beginner's project, it doesn't need to be something that takes a workshop full of esoteric tools or years of study and work. A table saw, drill press, and disc sander were available and used as well, but were not required and the work could have been accomplished with careful use of the simpler tools. The design was based on available space in a remodeled room and had to fit in with built-in bookshelves—other designers will not have these limitations and can modify the design as desired to fit their own space and requirements. The actual table top was little more than a slab of birch plywood with some decorative edging. Birch plywood is more expensive than the regular pine but is well worth it in appearance. 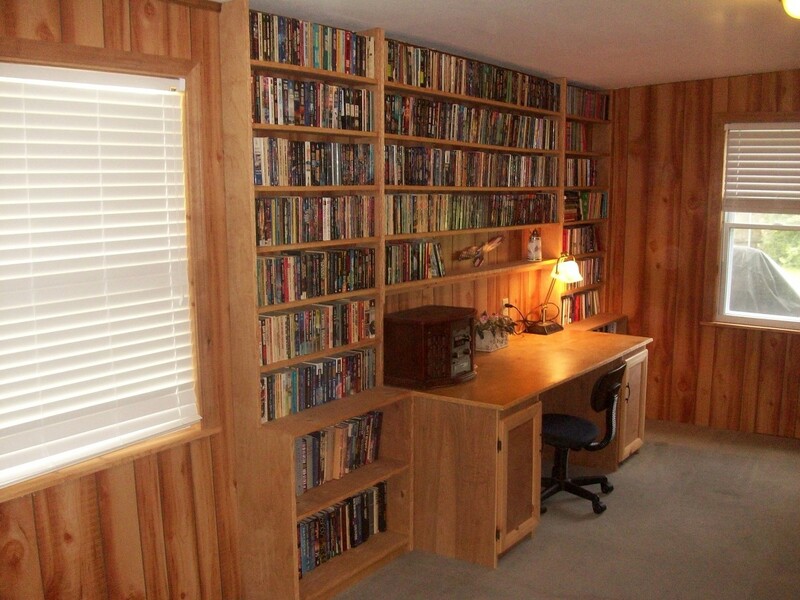 The picture below shows the entire sewing table fitted into the space between built-in bookshelves; the shelving was constructed first and thereby defined the size of the sewing table. In this case, the top was made to be 72" by 29". The plywood was cut using a circular saw equipped with a plywood blade and with a straightedge clamped to the plywood as a guide for the saw. 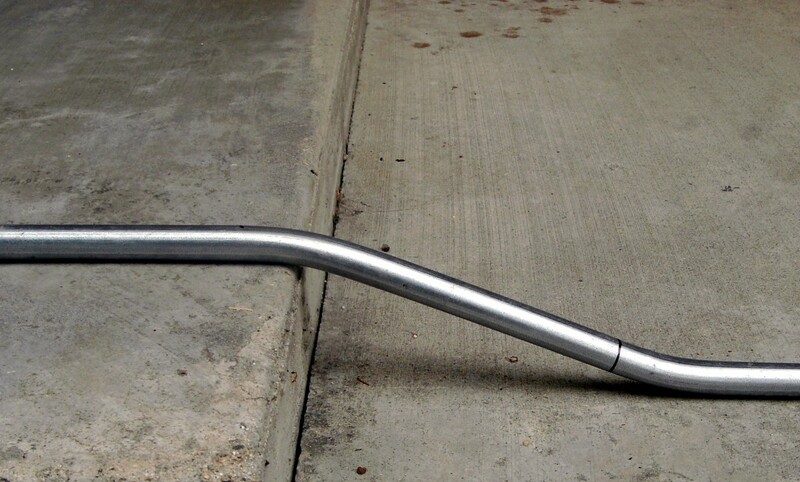 A much straighter cut may be made in that manner. If the sewing table is to fit into a larger area, dimensions need to be modified by the thickness of the decorative edging treatment. The edges of plywood are rough and ugly, and no amount of sanding can change that. A decorative molding was found on a closeout deal at Home Depot and used to cover the edges. If such molding is not available, the edges can be covered by ripping a 1 x 4 the long way into 1/4 x 3/4 inch strips and gluing and nailing them to the edges. The table top was sanded thoroughly using a random orbit sander and set aside for staining later. Although this sewing table was finished using a lightly colored polyurethane stain to match the shelving, as were the sewing cabinets, it could be stained any color desired or even painted. 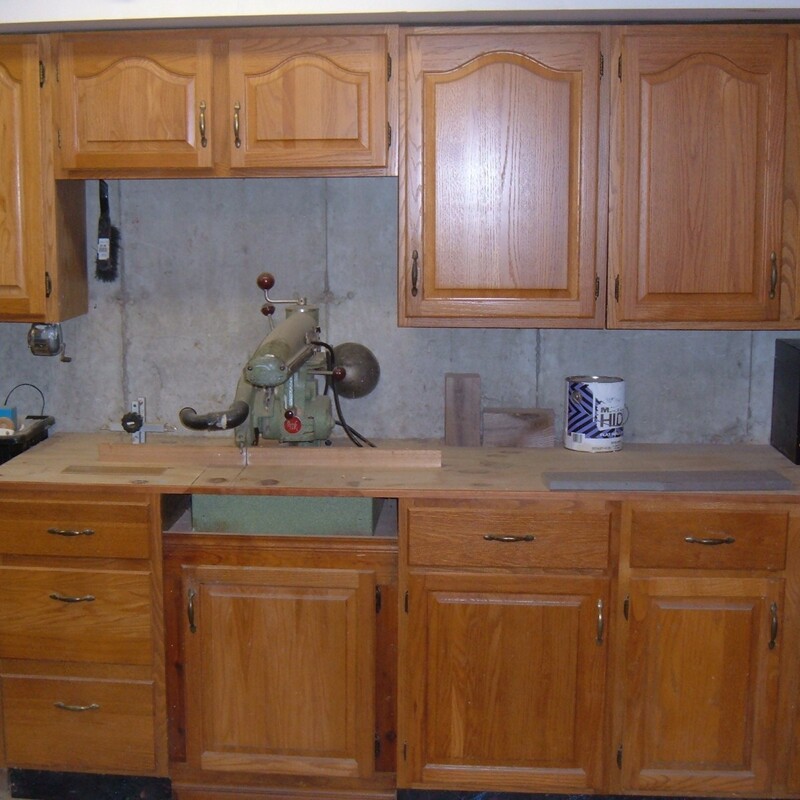 Two cabinets were constructed of the same birch plywood, pine boards and ¼" luann plywood. They both measure 28" deep by 28" tall by 16" wide. Height was decided by the height of the finished sewing table, and the depth was decided by the depth of the table top—it is 1" less than the top. A wider cabinet could be built if the top is to be wider, but a longer distance between the two sewing cabinets would require additional support for the top. 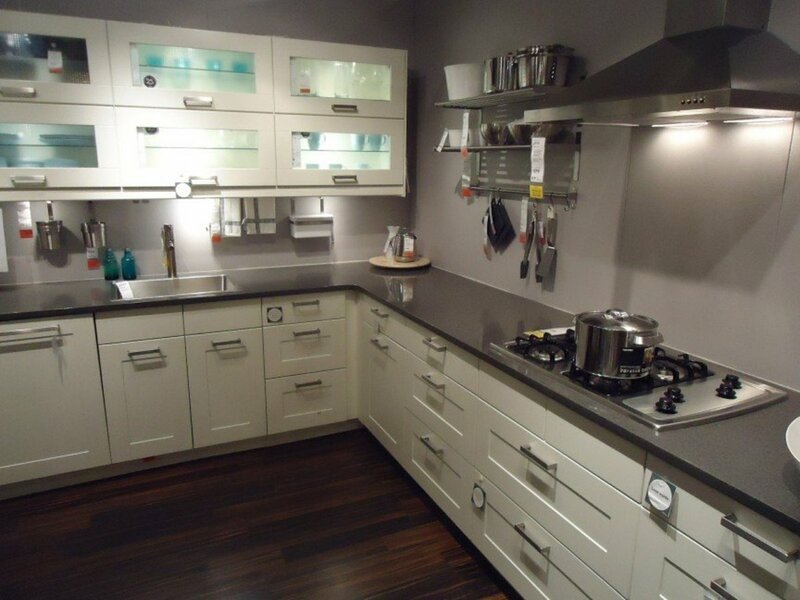 Both cabinets are constructed basically the same and are of the same overall size—only the interiors are different. A dado (slot) was routed into the sides from front to back at 2" above the bottom for the bottom shelf to fit into. There is no back to the cabinet (the wall serves the purpose here), but one cut from ¼" luan plywood could be added simply enough. Front pieces were added to the top 3" and bottom 2" (under the bottom shelf). The top piece is set flush with the finished cabinet front, while the bottom piece is set in just 1". These two small pieces serve to hold the cabinet together, along with the bottom shelf and the sewing table top. Each individual piece needs to be well sanded and ready for stain before assembly, as sanding in the corners would be difficult. The cabinet door frames are constructed of 1 x 4 pine wood, with a ¼" dado routed around the inside of the pine frame, and a decorate edge routed around the outside edge. A ¼" thick piece of luann plywood, chosen for the color contrast, is used for the center portion of the cabinet door. See the pictures for details of the construction. The 1 x 4 door frame is put together using gluing biscuits, while the plywood center is attached just with glue. 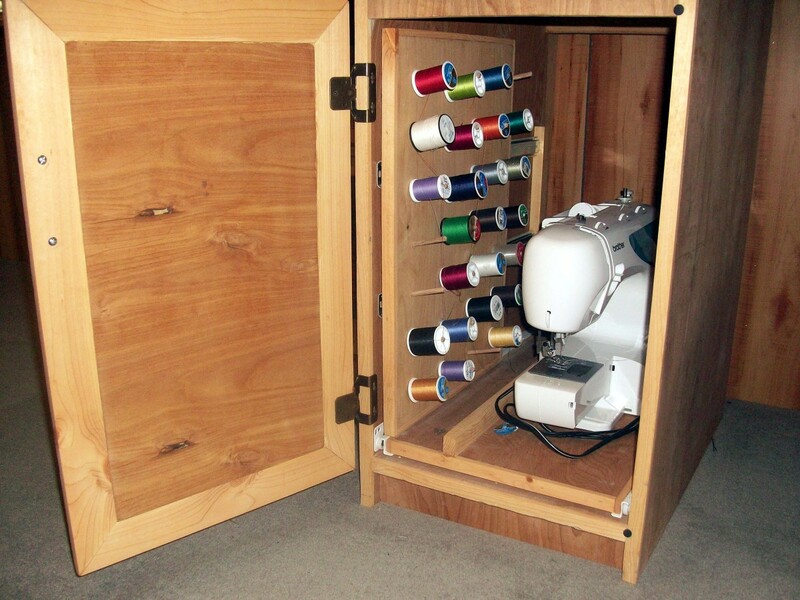 The left sewing cabinet is intended for storage of the sewing machine and for thread storage. A simple shelf of plywood is used for the sewing machine shelf and has the edges covered with thin strips of pine. It is cut slightly smaller than the inside of the cabinet and mounted on drawer slides so that it can be pulled in and out. 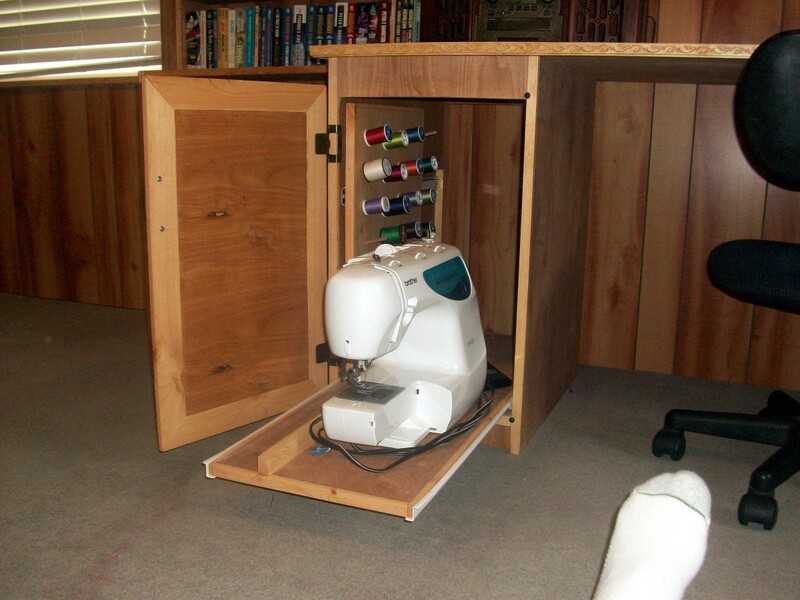 In this way, the heavy sewing machine does not have to be wrestled into the cabinet. A guide was added to the shelf to keep the sewing machine away from the thread storage rack. A second piece of plywood was cut and edge trimmed for thread storage. About 28 ¼" diameter holes were drilled into it at a slight angle and in an even pattern and 2" long pieces of ¼" dowel glued into the holes as a thread storage rack. The plywood was mounted on special slides that do not separate as normal drawer slides do and mounted to the side of the cabinet so that the thread storage also slides in and out. Extra care must be taken with these slides, as they must be absolutely parallel with each other. The cabinet was stained the same color as the top, self-closing hinges and a drawer pull were added and the cabinet set aside for final assembly. 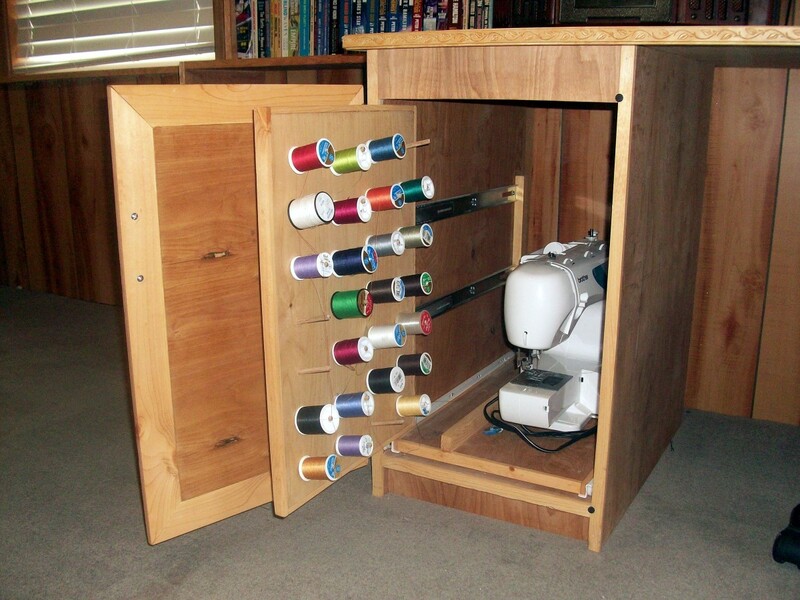 The right-hand sewing cabinet is intended for small sewing tools, needles, patterns, and such. As noted, the cabinet itself is constructed the same way and same size as the left cabinet, but instead of sliding shelves it contains three drawers of various sizes. The drawers were constructed to be 20" deep and 13" wide, but be aware that the width dimension in particular is determined by the size of the drawer slides to be used. Various lengths of a particular brand of drawer slide are normally available, but the thickness of the slides coupled with the inside width of the cabinet is what determines the width of the drawer. 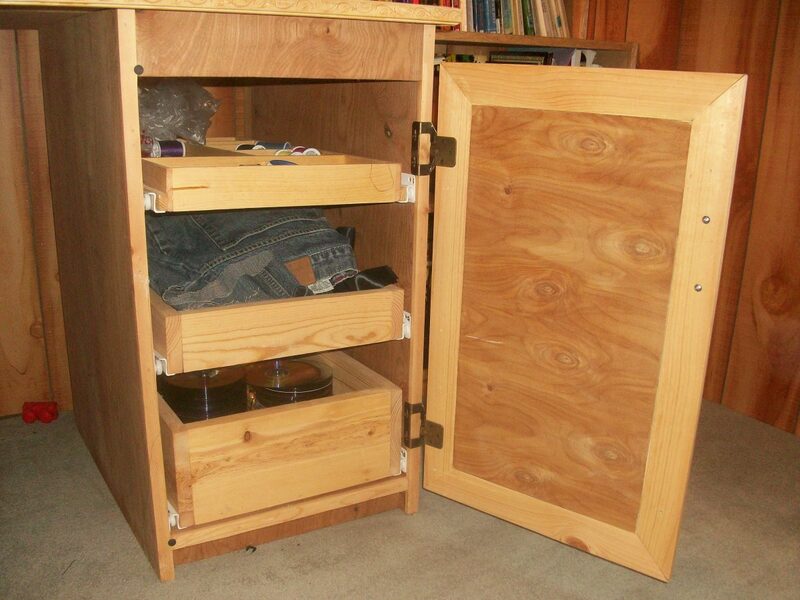 Drawers are constructed of 1 x 4 and 1 x 6 pine, with a ¼" luann bottom. Dadoes were again cut into the inside sides of the drawer sides for the bottom to fit into—this produces a strong drawer. Sides were put together with the biscuit joiner; simply butting them together with finishing nails and glue will surely result in a drawer that will fall apart under use. The drawers were made at three different heights for different storage solutions, and the top drawer (see photo) has thin plywood dividers glued into place to provide several compartments of varying sizes for such things as thimbles, needles, scissors, and such. The sewing cabinets were set into place and screwed into the bookshelves already attached to the wall as a safety precaution with children in the house. Two-inch "L" brackets (a simple steel bracket shaped like an uppercase L and pre-drilled for screws) were screwed into the interior of the sides so that they were just flush with the top of the sewing cabinets. 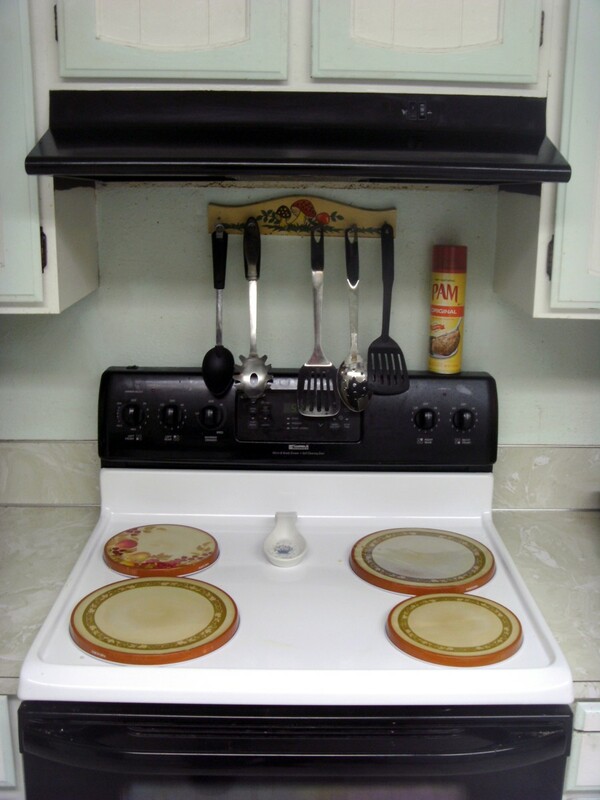 The top was lowered into place and—working through the cabinets with all drawers removed—screws were driven through the L brackets into the top. Additional L brackets were added to the bottom of the top at the rear, fastening the top to the wall. This top was wide enough that a heavy weight placed on it could bow it down and possibly break it without such additional support. If the wall were not available to provide that support, additional 1 x 4 boards could be fastened under the top, extending from cabinet to cabinet (fastened with the 4" dimension vertical that would provide plenty of strength and rigidity). This sewing table and its cabinets cost under $200 for all the materials and took about two weeks of working part-time on it to complete. It was designed to fit well into a major sunroom makeover, and that limited the design possibilities. But when finished, it has provided the owners with the perfect sewing table for their needs and a good deal of pride in its construction. 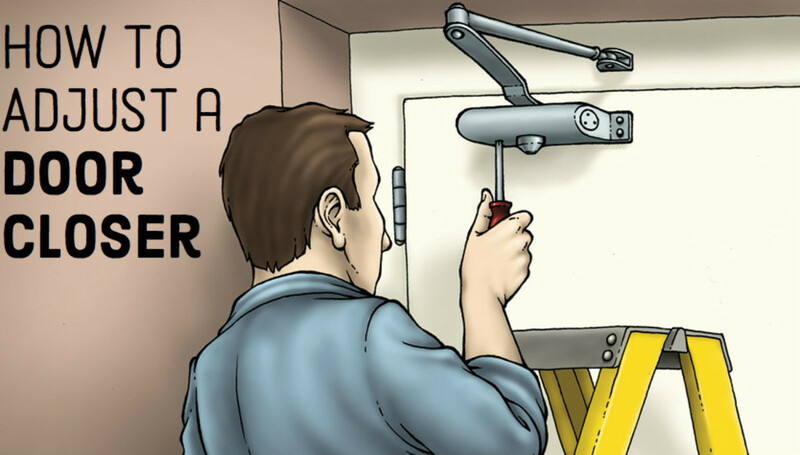 Should you, the reader, feel that although you have done some woodworking this kind of project is simply beyond your capability, I suggest you take a few minutes and check out this article on learning to do home improvements. While a few power tools would be considered necessary for the task, most homeowners already own the common hand tools required. 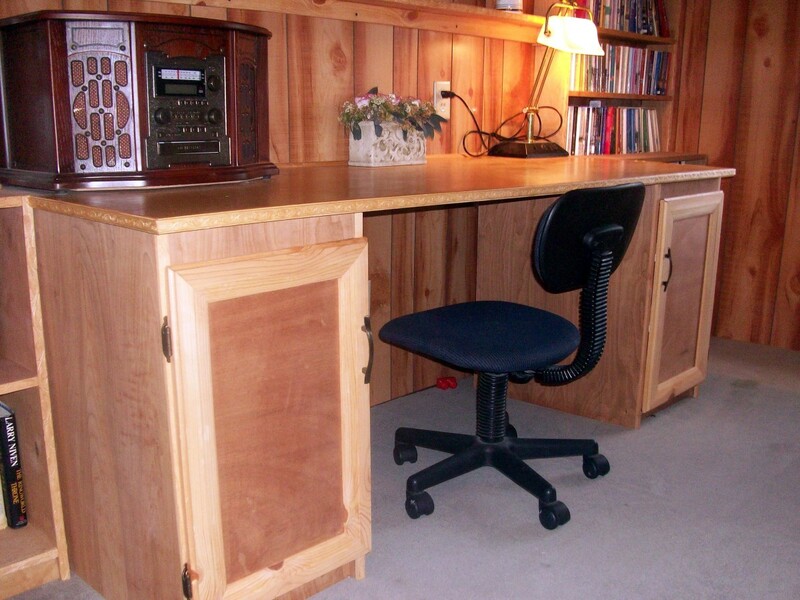 Or, if you enjoy working with furniture, a desk refinishing project might be to your taste. Thanks for outlining your project and providing details with tips that will help others design their own sewing table and cabinets. Yours looks good and looks like it works really well in a multifunction room. Using it or seeing it used must be very satisfying!